Who is the most attractive girl in Rosario+Vampire? 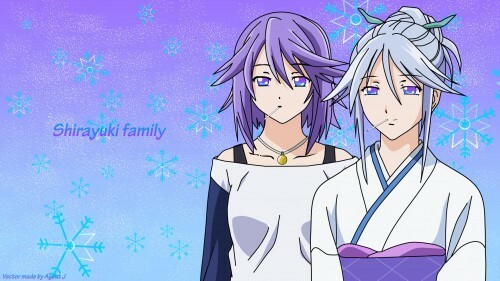 Which hair style anda like Mizore? Say Moka went crazy and tried to kill Mizore, would anda fight moka (true vampire form) knowing that there was no chance to survive? pilihan fans: Of course, I would die if it meant I could save the cinta of my life. Any Mizore fan still around? Remember Fujisaki? If not, quick reminder. The S.O.B. who raped and drove Mizore crazy. Turns out he's Alucard. Who will gabung me to defeat this powerful vampire? On a whim,I decided to investigate what had become of this fanpage. fanpop itself seems pretty dead now, and I doubt anybody will even see this. Still, I'd like to post one last article, and see if any other fan were still here. To this day, I still cinta Mizore. Perhaps not in the same angsty, teen obsession sort of way, but there's no denying she had a major impact on my life, to what may seem to some to be an embarrassing degree. Here and now, I'd like to relay how much this character actually changed my life. After nearly ten years in the run, the komik jepang Rosario Vampire has ended, with only an epilogue in April left. This means no lebih Youkai Academy, no lebih Tsukune & Moka, and most important to many of us, no lebih Mizore. It's hard to believe it's finally come to an end, even after the last chapter specifically stated this would be the final chapter, it still only seems to be sinking in now. Today is Dec 7th, also known as Mizore's birthday. And to celebrate this tahun I have decided to share my opinion of Mizore's talents. This is my thinking process only, so if anda think different, please place your opinion in the komentar below. Where would I even begin. From the moment I first saw her in the manga, I was immediately intrigued with her. She was unique. A shy, sweet girl that seemed willing to kill to escape the loneliness she was lost in. I too understood that loneliness. For 4 years of my adolescent life I had no friends. I had driven the original ones away, and as I grew without friends, I became odd, creepy even, and people didn't want to be around me. I became drawn to her lebih and lebih as I learned lebih about her, and eventually, she took a permanent root in my heart. This is the 1st Mizore cinta artikel Contest. I will be the judge but not take part in it. I want to see which Mizore Lover fan can tampil me how much anda lover her. anda must pindah me to tampil u cinta her. after I read them all I will announce the winner of the contest. There is no reward but to the reward is knowing anda showed your lover for her. The reason I'm not taking part because its cheating for the judge to take part in this contest. I cinta her also but I want to see other how much anda cinta her. Mizore Shirayuki (白雪 みぞれ, Shirayuki Mizore) is a yuki-onna. Keeping in line with Japanese mythological monster, she has the ability to control the element of ice at will, and can form clones composed of berkata element. In the past, she confessed to a teacher, until he began trying to take advantage of her, this froze him. With the incident and rumours spreading about her, Mizore made it hard for herself to trust anyone, but took a liking to Tsukune Aono, believing he was just as miserable as she was. My anime and komik jepang fan group on facebook please gabung because we lack of Mizore Shirayuki fan PLEASE gabung THE F.A.M.E.! an article telah ditambahkan: Perhaps the last artikel in a wasteland. an answer was added to this question: Again, IS ANYBODY HERE?! Why do we cinta Mizore Shirayuki?